Notes is a handy native app on your iPhone that can help you make sense of a busy schedule. Using Notes, you can create a checklist and mark items off when complete. 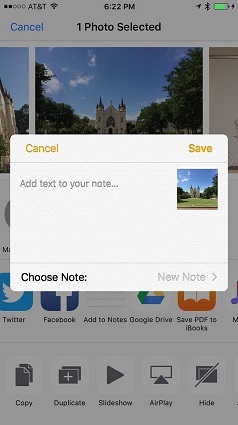 In addition, you can add a shared item to a note. The Checklist formatting feature in Notes allows you to add circular buttons in front of text, then tap those buttons to check off completed items on a checklist. With a note open and the shortcut toolbar displayed, tap the Checklist button. Enter text and press Return on the keyboard. A second checklist bullet appears. When you’re done entering Checklist items, tap the Checklist button again to turn the feature off. You can apply the Checklist formatting to existing text if you press on the text, tap Select or Select All, then tap the Checklist button. In iOS 10, you can share items to a note. 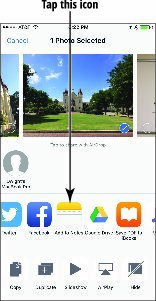 For example, if you are displaying a map in Maps or a photo in Photos, you can tap the Share button, then choose Add to Notes. When you do, in the dialog that appears, you can either add text to the note and save it or select an existing note to add the item to.